I’m going to visit my family on Long Island soon which means I am putting together a mega meal plan for the week. Feeding 15 people of all different ages breakfast, lunch and dinner requires some careful planning. I usually do the menus as well as take on the role of head chef. My mother typically does the grocery shopping and helps with the cooking. My two sisters also help with the cooking and washing of the dishes. The little ones set and clear the table and occasionally I get one or two of them in the kitchen with me. It’s a good way to spend time together and make sure not one person (like me LOL) does everything. 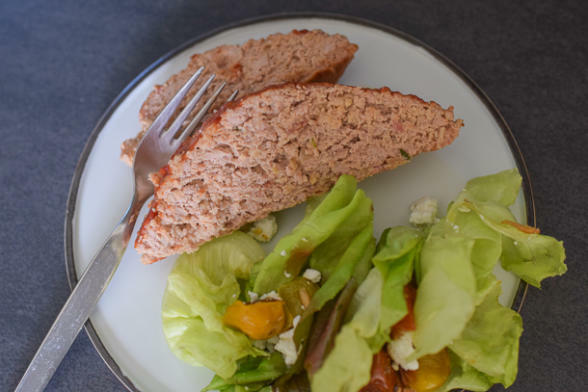 One recipe I make every time because it feeds a crowd and everyone loves it is Gwenyth Paltrow’s turkey meatloaf from her cookbook, “It’s All Easy.” As you know, I am not a big meat or poultry eater, but I absolutely love this meatloaf. I am going to go out on a limb and say it’s the best one I have ever tried! I think the secret is all the minced onion and turkey bacon in the mix. They give the meatloaf so much flavor and moisture. I am guilty of going back for seconds and thirds and even eating it cold the next day. Who am I???? Here and in general, I always opt for organic dark ground turkey meat. Organic is non-negotiable for me when it comes to meat, and the dark turkey meat has so much more flavor and stays moister. Even if someone thinks s/he doesn’t like dark meat poultry, I pretend I don’t know that information and make it this way. Ironically, I used to detest dark meat poultry when I was younger and now I prefer it. Again, I ponder the question, who am I??? I have thought about making this meatloaf in muffin tins to speed up the cook time and because muffin meatloaves (meat muffins? Yikes!) are so cute. But the portion size is just too small for me! Ha! I used to resist the layer of ketchup on the exterior of meatloaf because ketchup is not a great food – loads of high fructose corn syrup being my chief complaint. But there are lots of options out there for cleaner products. And I now understand the appeal of the sweet, tangy layer on the outside with the smoky, salty flavor of the actual meatloaf. So good! I usually serve this with lighter sides, like salad (the one shown here is Nathan Turner’s Roasted Cherry Tomato Salad), grilled non-starchy vegetables like zucchini, or a simple tomato and basil salad. Bascially, NOT mashed potatoes! Other options in the summer are coleslaw, honey-lemon green beans, or grated carrot salad with avocado. One down, 20 meals to go! 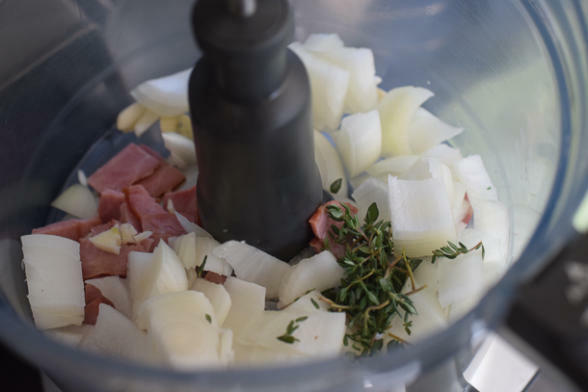 Combine the turkey bacon, onion, garlic, and thyme in the bowl of a food processor. 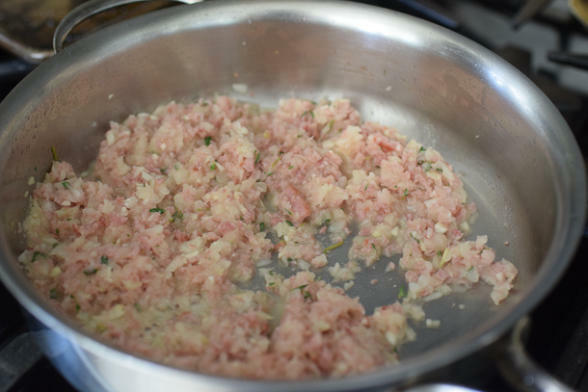 Process until minced but stop before the mixture becomes a paste. Heat the olive oil in a large saute pan over medium-high heat. Add the onion mixture and cook for 6 to 8 minutes, or until slightly browned and fragrant. Set aside to cool. While the onion mixture cools, in a large bowl, combine the oats, milk, Worcestershire, 2 Tablespoons of the ketchup, the salt, egg, and pepper to taste and mix well with your hands. Add the sautéed onion mixture and the ground turkey and mix until everything is evenly incorporated. At this stage, the mixture looks quite wet - don't worry, it will firm up in the oven. 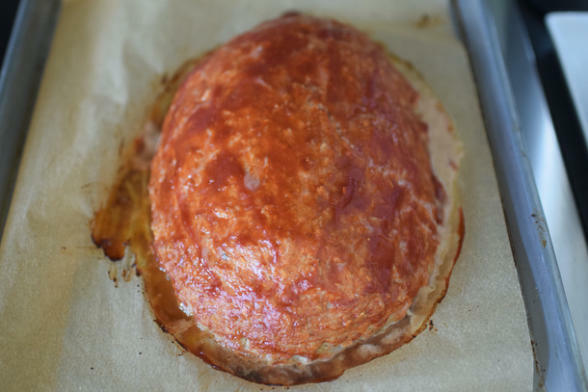 Place the meat loaf on a parchment lined baking sheet and shape it into a rounded rectangle. Brush the top with the remaining ¼ cup ketchup and bake for 45 minutes (place a small pan of water on the bottom oven rack to keep the meat loaf moist). *There are lots of ketchups which don't use high fructose corn syrup. Look for Primal Kitchen, or Thrive Market private label or Annie's. Yikes.. I just realized the 1/4 cup of ketchup goes on top and not in the mixture.im sure it will still be yummy. It’ll just be extra moist! Can you share your meal plan for your vacation? I am also in charge of meal planning for our family trip of 17! My family loves meatloaf. I like to prepare meatloaf and bake in my mini loaf cake pan. It makes 9 mini loafs. An easy option to partially bake and freeze for later use. I cannot wait to try this healthy option! Love that idea! Thanks, Kathy! We love this recipe! I did once use plain, unsweetened almond milk and it worked just fine. I got Gwenyth’s cookbook awhile back for Mother’s Day and made this meatloaf. It is the best meatloaf I have ever had! 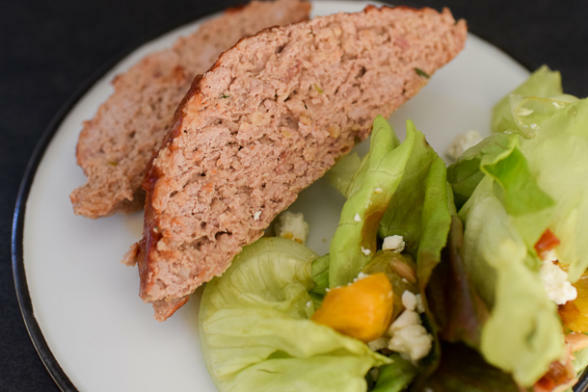 I grew up not liking meatloaf but this has changed with this recipe. My ENTIRE family loves this meatloaf. I actually had to make it for my mom’s birthday one year because she likes it so much. Who has meatloaf on their birthday?! I only make this meatloaf if I make meatloaf. It comes out delicious Every. Single. Time. You will never be disappointed with it. Thank you for posting it so everyone can enjoy its yumminess.